Free Method: How to save YouTube videos? Download the FREE Software Xilisoft Download YouTube Video now, install and follow the steps to complete the task. Visit www.youtube.com , browse YouTube videos and select. 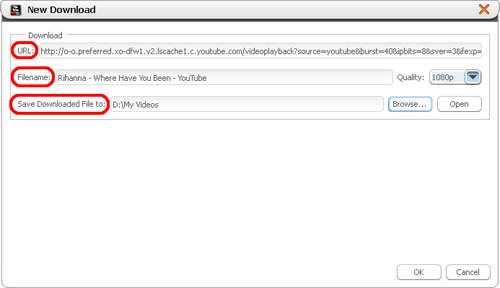 Tips 1: You can also drag and drop the video URL directly to the main window or to Drop Zone to create a new task. Tips 2: Right click the YouTube video thumbnail or URL, and select "Download with Xilisoft Download YouTube Video" option from the right-click menu, then the "New Download" dialog appears, and the video URL is automatically added into the "URL" textbox. Adjust the Destination and Start Task options in the "New Download" dialog above. Start the YouTube video downloading task. Click "OK" button to close the "New Download" dialog, then click "Start" button on the toolbar to start the task. If you set the "Start Type" option as "Start Now", then the selected video will be promptly downloaded and converted to the format you choose and saved to the folder you set in the Step 3. More info you can visit: FREEWARE - Xilisoft Download YouTube Video.